« Keto Spinach Feta Egg Muffins Grab & Go Breakfast! Rice and potatoes, we low carbers fear them, but probably dream of them every night! After all, what is Butter Chicken without rice? What is Beef stew without potatoes? Rice and potatoes are the ultimate comfort food when topped with stews, sauces and other tasty and drippy foods. And what other food can catch all those yummy juices? Well let me show you how I use my handy, dandy KitchenAid Food Processor to turn the humble and lowly cauliflower into both of these delicious dishes. Both of these dishes are all over the internet in various forms. I’d like to credit I Breathe, I’m Hungry for turning me onto cauliflower in a major way. Check out that site for lots of other great cauliflower recipes. Take 1/2 large head of cauliflower, wash it and break into chunks. Place in your food processor. Pulse until it looks like rice! In a non stick ceramic pan with either 2 tbsp olive oil, butter or coconut oil, saute 3 chopped green onions and 2-3 sprigs of chopped parsley. Add in the riced cauliflower. Stir in 2 teaspoons cumin. Fry the ‘rice’ until it is the texture you want. I like it almost soft. These are another staple in my house. I especially love this under Pork Belly Adobo or Butter Chicken. 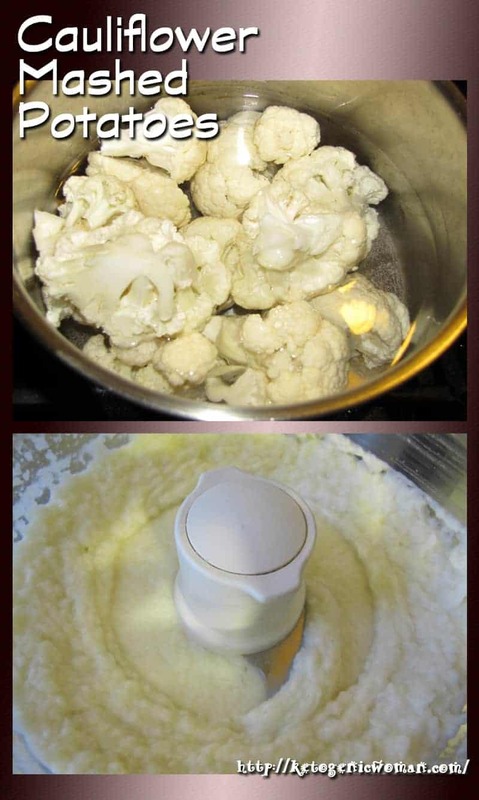 Break a head of cauliflower in chunks and boil until fork tender. Once they are tender, place them in the food processor . Puree until smooth. You might have to scrape the sides once. These are SO much like mashed potatoes, you will never miss them! I promise! Here are a few of my recent dinners using these amazing ‘rice’ and ‘potatoes’! Tagged cauliflower, cauliflower mashed potatoes, cauliflower rice, keto recipes, LCHF, low carb, what to eat on ketogenic. Bookmark the permalink. I tried making the cauliflower “mashed potatoes” but haven’t been successful so far… is it absolutely necessary to use a food processor? I don’t have one so Ive tried a nutri-bullet and a hand beater but both times it still came out chunky and stringy (the nutri-bullet spins too fast and pushed the cauliflower immediately to the sides). Can I use frozen cauliflower or does it have to be fresh? If you want that nice smooth texture then I’m afraid the food processor really is the best tool for the job. But it’s one of those kitchen tools that you will have forever and is a real workhorse. I can’t live without mine. I’m pretty sure frozen cauliflower would work, you would also have to cook it first. Good luck! Frozen works great, cook until really soft the put them thru a ricer, I have a steamer pan that sits on top of another pan and a masher to push it thru the holes, a foley food mill will also do the trick. Look for these things at thrift stores. these are both awesome, i have tried them riced(no rice) and as mashed potatoes! today i make the cauliflower casserole! loving cauliflower. We just had our Canadian Thanksgiving last weekend and I made the ‘mashed potatoes’. Even the non low carb people thought they tasted great! Glad you liked the recipes. i haven’t tried these yet,but I’m sure going to. I don’t eat white potatoes or white rice soooo. Thanks. Thanks for visiting! Hope you enjoy them! I love both the rice and the potatoes, it’s a staple here. I hope this one works out for you. Yummm! Must try this ! haha, I hear some people say collie flower and then others say colla flour. The ‘mashed potatoes’ are a dream come true for me! Looks really delicious! I plan to make some, minus the oil… will probably use sesame seeds instead if I want some creaminess. I’m printing this off. This loos really good. I am trying some gluten free recipes out, and these look so amazing! I never would have thought to mix rice and cauliflower together! There’s no rice in this at all! Just cauliflower!